← Is that a big number? I would have excluded Turkey as well as the US as outliers in plotting this graph (and therefore modelled it with a linear regression.) Plus it’s a shame that more countries aren’t included. But still, I’m not surprised to see a positive correlation between the two variables. 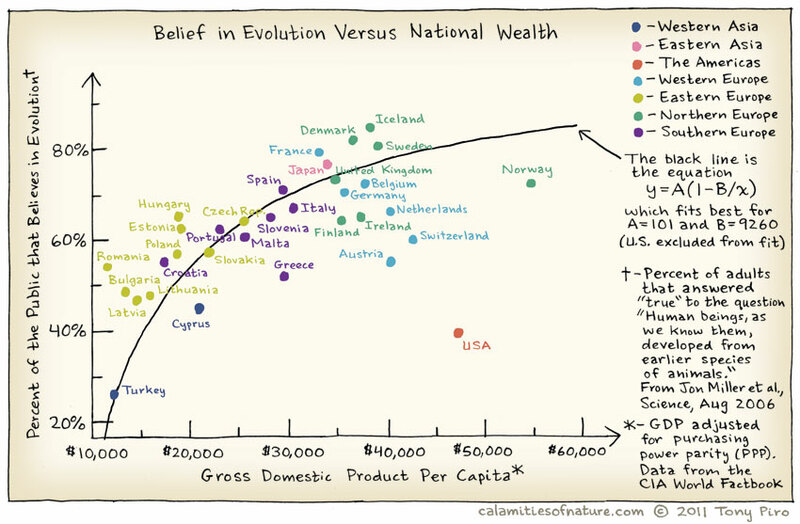 The wealthier a nation the less religiously inclined it will be hence the believe in evolution. It is however funny that 60% of this people that agree with evolution do have little or no idea whaat it really means. Religion plays a big part in the result for the US. Not just religion, but fundamentalism specifically in the US. It is not socially, or politically correct in the US to believe in evolution. I think in private more people do in fact believe in evolution, but they would never publicly state it. In the states we go out of our way to muddy the waters on the topic.